History of Knoxville, Tennessee, began with the establishment of James White's Fort on the Trans-Appalachian frontier in 1786. The fort was chosen as the capital of the Southwest Territory in 1790, and the city, named for Secretary of War Henry Knox, was platted the following year. 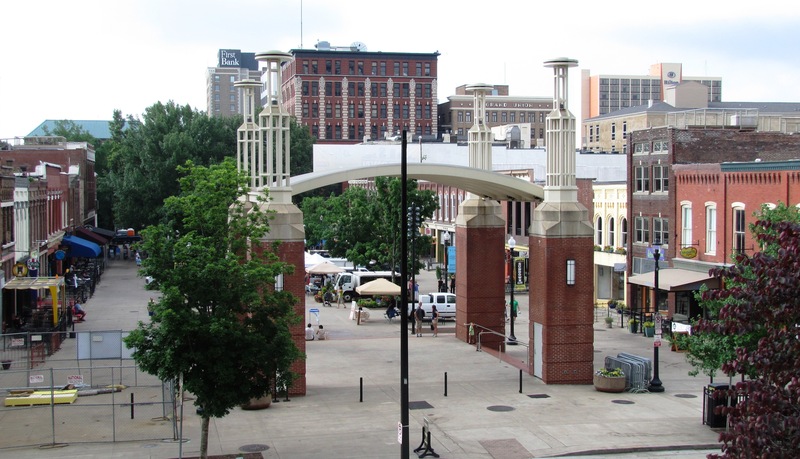 Knoxville became the first capital of the State of Tennessee in 1796, and grew steadily during the early 19th century as a way station for westward-bound migrants and as a commercial center for nearby mountain communities. The arrival of the railroad in the 1850s led to a boom in the city's population and commercial activity. While a Southern city, Knoxville was home to a strong pro-Union element during the secession crisis of the early 1860s, and remained bitterly divided throughout the Civil War. The city was occupied by Confederate forces until September 1863, when Union forces entered the city unopposed. Confederate forces laid siege to the city later that year, but retreated after failing to breach the city's fortifications during the Battle of Fort Sanders. Following the war, business leaders, many from the North, established major iron and textile industries in Knoxville. As a nexus between rural towns in Southern Appalachia and the nation's great manufacturing centers, Knoxville grew to become the third-largest wholesaling center in the South.Tennessee marble, extracted from quarries on the city's periphery, was used in the construction of numerous monumental buildings across the country, earning Knoxville the nickname, "The Marble City." Late-Woodland period burial mound on the University of Tennessee campusThe first humans to form substantial settlements in what is now Knoxville arrived during the Woodland period (c. 1000 B.C. – 1000 A.D). Knoxville's two most prominent prehistoric structures are Late Woodland period burial mounds, one located along Cherokee Boulevard in Sequoyah Hills, and the other located along Joe Johnson Drive on the U.T. campus. Substantial Mississippian period (c. 1100–1600 A.D.) village sites have been found at Post Oak Island (along the river near the Knox-Blount line), and at Bussell Island (near Lenoir City). While Blount initially sought to place the territorial capital at the confluence of the Clinch and Tennessee rivers (near modern Kingston), where he had land claims, he was unable to convince the Cherokee to completely relinquish this area, and thus settled on White's Fort as the capital. :6–7 James White set aside land for a new town, which initially consisted of the area now bounded by Church Avenue, Walnut Street, First Creek, and the river, in what is now Downtown Knoxville. White's son-in-law, Charles McClung, surveyed the land and divided it into 64 half-acre lots. Lots were set aside for a church and cemetery, a courthouse, a jail, and a college. On October 3, 1791, a lottery was held for those wishing to purchase lots in the new city, which was named "Knoxville" in honor of Blount's superior, Secretary of War Henry Knox. 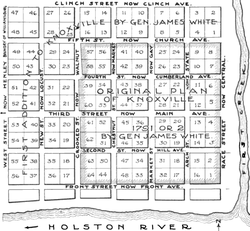 Along with Blount and McClung, those who purchased lots in the city included merchants Hugh Dunlap, Thomas Humes, and Nathaniel and Samuel Cowan, newspaper publisher George Roulstone, the Reverend Samuel Carrick, frontiersman John Adair (who had built a fort just to the north in what is now Fountain City), and tavern keeper John Chisholm. While Knoxville's population grew steadily in the early 1800s, most new arrivals were westward-bound migrants staying in the town for a brief period. By 1807, some 200 migrants were passing through the town every day. :75 Cattle drovers, who specialized in driving herds of cattle across the mountains to markets in South Carolina, were also frequent visitors to the city. :75 The city's merchants acquired goods from Baltimore and Philadelphia via wagon trains. French botanist André Michaux visited Knoxville in 1802, and reported the presence of approximately 200 houses and 15 to 20 "well-stocked" stores. While there was "brisk commerce" at the city's stores, Michaux noted, the only industries in the city were tanneries. In February 1804, itinerant Methodist preacher Lorenzo Dow passed through Knoxville, and reported the widespread presence of a religious phenomenon in which worshippers would go into seizure-like convulsions, or "jerks," at rallies. Illinois governor John Reynolds, who studied law in Knoxville, recalled a raucous, anti-British celebration held in the city on July 4, 1812, at the onset of the War of 1812. On October 27, 1815, Knoxville officially incorporated as a city. The city's new charter set up an alderman-mayor form of government, in which a Board of Aldermen was popularly elected, and in turn selected a mayor from one of their own. :75 This remained Knoxville's style of government until the early 20th century, though the city's charter was amended in 1838 to allow for popular election of mayor as well. :76 In January 1816, Knoxville's newly elected Board of Aldermen chose Judge Thomas Emmerson (1773–1837) as the city's first mayor. 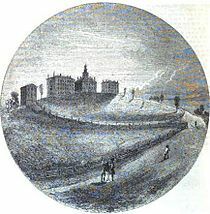 East Tennessee College, the forerunner of the University of Tennessee, moved to "The Hill" west of downtown Knoxville in 1826In 1816, as the Gazette was in decline, businessmen Frederick Heiskell and Hugh Brown established a newspaper, the Knoxville Register. Along with the Register, Heiskell and Brown published a pro-emancipation newsletter, the Western Monitor and Religious Observer, as well as books such as John Haywood's Civil and Political History of the State of Tennessee (1823), one of the state's first comprehensive histories. :15 The Register celebrated the move of East Tennessee College (the new name of Blount College following its rechartering in 1807) to Barbara Hill in 1826, and encouraged the trustees of the Knoxville Female Academy, which had been chartered in 1811, to finally hire a faculty and hold its first classes in 1827. 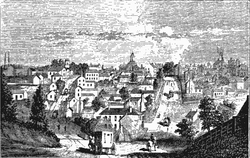 Knoxville in the late-1850s, viewed from the west along Cumberland AvenueIn the April 1839 issue of the Southern Literary Messenger, a traveler who had recently visited Knoxville described the people of the city as "moral, sociable and hospitable," but "with less refinement of mind and manners" than people in older towns. In 1842, English travel writer James Gray Smith reported that the city was home to a university, an academy, a "ladies' school," three churches, two banks, two hotels, 15-20 stores, and several "handsome country residences" occupied by people "as aristocratic as even an Englishman... could possibly desire." 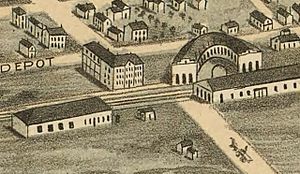 The East Tennessee, Virginia and Georgia rail yard at the intersection of Gay Street (lower right) and Depot Street, as it appeared in 1871; the roundhousehas since been demolished and replaced by theSouthern TerminalAs early as the 1820s, Knoxville's business leaders viewed railroads— then a relatively new form of transportation— as a solution to the city's economic isolation. 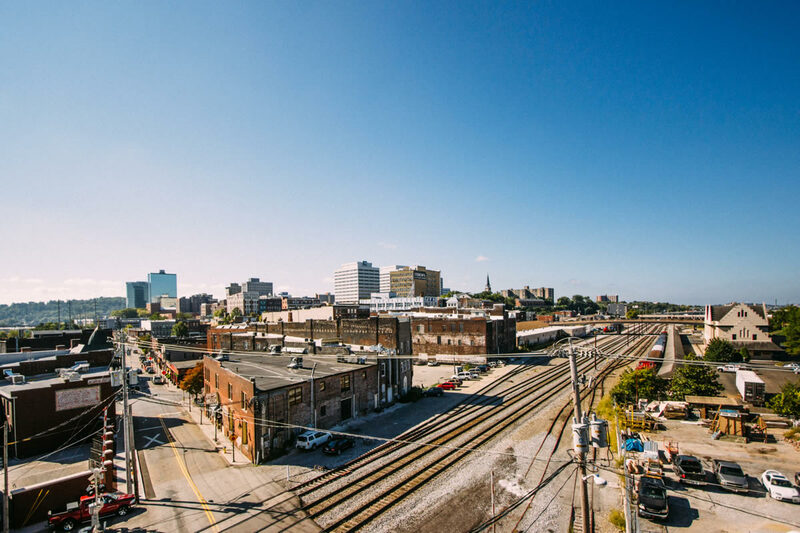 Led by banker J. G. M. Ramsey (1797–1884), Knoxville business leaders joined calls to build a rail line connecting the city toCincinnati to the north and Charleston to the southeast, which led to the chartering of the Louisville, Cincinnati and Charleston Railroad (LC&C) in 1836. The Hiwassee Railroad, chartered two years later, was to connect this line with a rail line in Dalton, Georgia. The railroad also led to a boom in the quarrying and production of Tennessee marble, a type of crystalline limestone found in abundance in the ridges surrounding Knoxville. By the early 1890s, twenty-two quarries and three finishing mills were in operation in Knox County alone, and the industry as a whole was generating over a million dollars in annual profits. :204–6 Tennessee marble was used in monumental construction projects across the nation, earning Knoxville the nickname, "The Marble City," during the late 19th century. 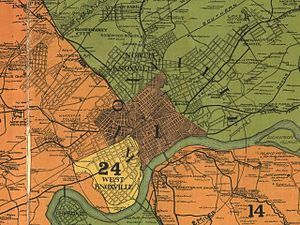 Knoxville in 1895, with North Knoxville and West Knoxville, which were separate cities until 1897Knoxville's first major annexation following the Civil War came in 1868, when it annexed the city of East Knoxville, an area east of First Creek that had incorporated in 1855.:137–8 In 1882, Knoxville annexed Mechanicsville, which had developed just northwest of the city as a village for Knoxville Iron Company and other factory workers. In the 1870s and 1880s, the development of Knoxville's streetcar system (electrified by William Gibbs McAdoo in 1890) led to the rapid development of suburbs on the city's periphery. :100–101 Neighborhoods such as Fort Sanders, Fourth and Gill,Old North Knoxville, and Parkridge, are all rooted in "streetcar suburbs" developed during this period. As Knoxville grew, the city's boosters continuously touted the city as an industrial boom town in an attempt to lure major companies. In 1910 and 1911, two major national fairs, the Appalachian Expositions, were held at Chilhowee Park. A third, the National Conservation Exposition, was held in 1913. The fairs demonstrated the economic trend known as the "New South," the transition of the South from an agricultural-based economy to an industrial one. The fairs also advocated the responsible usage of the region's natural resources. Gay Street, photographed by theDetroit Publishing Company in the early 1900sKnoxville's rapid growth in the late 19th century led to increased pollution, mainly from the increasing use of coal,:29 and a rise in the crime rate, exacerbated by the influx of large numbers of people with very low-paying jobs. :27 The city, which had suffered serious cholera outbreaks in 1854 and 1873, and smallpoxepidemics throughout the 1860s, created a health department in 1879, and established a city hospital in 1884.:91–3 Activists such as Lizzie Crozier French and businessmen such as E.C. Camp established organizations that helped the poor. Child workers at Knoxville'sBrookside Mills, photographed byLewis Hine in 1910By the 1880s, Knoxville had a murder rate that was higher than Los Angeles's murder rate in the 1990s. 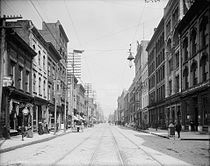 :102 Journalist Jack Neely points out that "saloons, whorehouses, cocaine parlors, gambling dens, and poolrooms" lined Central Street from the railroad tracks to the river. High-profile shootouts were not uncommon, the most well-known being the Mabry-O'Connor shootout on Gay Street, which left banker Thomas O'Connor, businessman Joseph Mabry, and Mabry's son, dead in 1882.In 1901, Kid Curry, a member of Butch Cassidy's Wild Bunch, shot and killed two police officers at Ike Jones's Bar on Central. The Kid Curry shooting helped fuel calls for citywide prohibition, which was enacted in 1907. 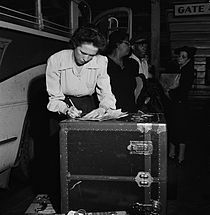 After World War I, the United States suffered a major economic recession, and Knoxville, like many other cities, experienced an influx of migrants moving to the city in search of work. Racial tensions heightened as poor whites and blacks competed for the few available jobs, and both theKu Klux Klan and the National Association for the Advancement of Colored People (NAACP) opened chapters in the city. On August 30, 1919, these tensions erupted in the so-called Riot of 1919, the city's worst race riot, which shattered the city's vision of itself as a racially tolerant Southern town. 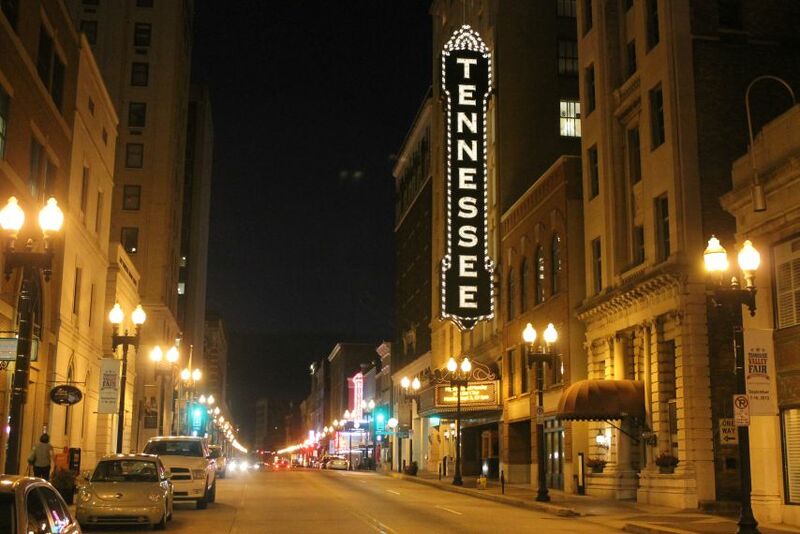 Preservation efforts in Knoxville, which have preserved historic structures such as Blount Mansion, the Bijou Theatre, and the Tennessee Theatre, have intensified in recent years, prompting the designation of numerous historic overlay districts throughout the city. The efforts of developers such as Kristopher Kendrick and David Dewhirst, who have purchased and restored numerous dilapidated buildings, gradually helped lure residents back to the Downtown area. In the 2000s, Knoxville's planners turned their focus to the development of mixed residential and commercial neighborhoods (such as the Old City), cohesive, multipurpose shopping centers (such as Turkey Creek in West Knoxville), and a Downtown area with a mixture of unique retailers, restaurants, and cultural and entertainment venues, all with considerable success. Historiography of KnoxvilleThe East Tennessee Historical Society's annual journal, published since 1929, contains numerous articles on Knoxville and Knoxville-area topics. The Society has also published two comprehensive histories of Knoxville and Knox County, The French Broad-Holston Country (1946), edited by Mary Utopia Rothrock, and Heart of the Valley (1976), edited by Lucile Deaderick. In 1982, the Society published a follow-up to Heart of the Valley, William MacArthur's Knoxville: Crossroads of the New South, which includes hundreds of historic photographs. Other comprehensive histories of the city include William Rule's Standard History of Knoxville (1900) and Ed Hooper's Knoxville (2003), the latter being part of Arcadia's "Images of America" series. Knoxville's history from the end of the Civil War to the modern period is covered in Knoxville, Tennessee: Continuity and Change in an Appalachian City (1983), written by Michael McDonald and Bruce Wheeler, and subsequently expanded by Wheeler as Knoxville, Tennessee: A Mountain City in the New South (2005). Mark Banker's Appalachians All (2010) discusses the development of three East Tennessee communities, Knoxville, Cades Cove, and the Clearfork Valley (in Campbell and Claiborne counties). Since the early 1990s, Metro Pulse editor Jack Neely has written numerous articles (often for his column, "The Secret History") that recall some of the more colorful, odd, obscure, and forgotten aspects of the city's history. Neely's articles have been compiled into several books, including, The Secret History of Knoxville (1995), From the Shadow Side (2003), and Knoxville: This Obscure Prismatic City(2009). Arcadia has published several short books on local topics as part of its "Images of America" series, including Ed Hooper's WIVK (2008) and WNOX (2009), and 1982 World's Fair (2009) by Martha Rose Woodward. Other books on Knoxville topics include Wendy Lowe Besmann's Separate Circle: Jewish Life in Knoxville, Tennessee, which details the development of the city's Jewish community, and Sylvia Lynch's Harvey Logan in Knoxville (1998), which covers Kid Curry's time in the city. The Junior League of Knoxville's Knoxville: 50 Landmarks (1976), provides descriptions of various historical buildings in the city. A more detailed overview of the city's architectural development is provided in "Historic and Architectural Resources of Knox County" (1994), a pamphlet written by Metropolitan Planning Commission preservationist Ann Bennett for the National Register of Historic Places. The National Register includes over 100 buildings and districts in Knoxville and Knox County, with extensive descriptions of the buildings provided in their respective nomination forms, which are being digitized for the Register's online database. Every block of Downtown Knoxville has a different name, different culture and an eclectic way of presenting that to the inhabitants. 100 Block of Gay Street. This houses many of the older condos and buildings as well as the original roads expansion bringing Gay Street itself up over 50 feet higher. Private tours are available for "underground Knoxville." This is the 200-600 block of Downtown Knoxville. Mast General Store and Market Square shopping are two beautiful places to visit while on this block. Many older buildings including the original Sears building have been converted into living spaces. This has become a newly renovated part of the "Old City" or 100 Block turnoff area of Downtown Knoxville. As recent as 2016, new construction is happening and several brewing companies have taken interest in relocating to this area. This was the center of town as mentioned in the History section. Several businesses and shops are located here as well as local festivals and a weekly farmers market. The night life of downtown. Several large manufacturing buildings stand here today converted into city dwelling and swanky late night entertainment spots. A less noticed area of Downtown but no less important. Union Ave houses some of the older hotels and shops in Knoxville. A local favorite, Pete's Cafe, offers down home cooking for locals and the five star historic hotel with the nationally recognized, Peter Kern Library, awaits this mysterious location. Where everyone goes to play on the river! This beautiful area hosts some fine dining and beautiful lakeside walking and biking. 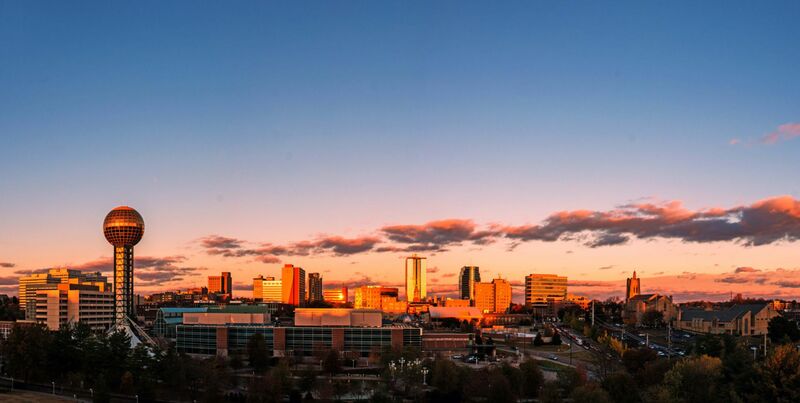 As a previous condo owner and resident of the Old City area of Downtown Knoxville, I can attest that I miss living int eh hustle and bustle of downtown life. The area boasts so many amazing things to do ranging from specialty coffee and beers to high end non-chain eateries that can truly blow your mind with creative foods. If you are seeking a place you can walk or bike or hike anywhere you need to be, this is it.